We'll put a warning here before we go any further. 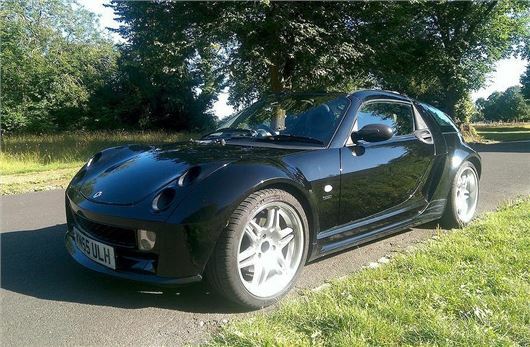 Yes the Smart Roadster is a very fun little car but it's also not without its problems. So it's important to tread carefully. Very carefully. I know because I once owned one. And while it was not without its charms, it was also not without its issues. But before we get into that, let's transport ourselves back to 2003. The City Coupe (later renamed the Fortwo) had been on sale for three years in the UK as a funky little city car that created a real stir. But while it was easy to park, sporty it was not. Then came along the wonderful little Roadster. Based on the same platform and using the same engines plus gearbox, it transformed what was the Fortwo into a characterful and yipee-here-we-go two seater. This is no high performance racer of course, but a fun and affordable little car that is a joy to drive. A modern day version of the MG Midget if you will. It's powered by a tiny 698cc three-cylinder engine but with a turbocharger fitted to give the Roadster a surprising turn of pace. The standard car has at most just 82PS (a lower powered 61PS version was available in the Roadster but is rare) but then it does only weigh 800kg and feels pretty brisk when you need it to. In our opinion the Roadster Coupe is better looking than the standard Roadster and if you want the best in the range then go for a Brabus. The tuning company previously worked on performance versions of Mercedes-Benz models but it is now probably best known for its work with Smart. Brabus versions get bigger 17-inch wheels, a sports exhaust, lower suspension while inside there are aluminium extras such as the handbrake and pedals, which help lift the plastic-heavy interior. But the real advantage of the Brabus model is a considerable power boost from 82PS to 101PS. Torque isn't massive with 130Nm but given the low kerbweight of the Roadster Coupe, it manages 0-62mph in 9.8 seconds. That may not sound that fast (and it's not...) but from behind the wheel, the Roadster always feels eager with a lovely whistle and tweet from the turbocharger when you change gear. This example we found in the classifieds is a 55-plate Roadster Coupe Brabus with 86,000 miles on the clock. That may seem a lot for a Smart Roadster but it's below average for a ten-year-old car. It's not perfect cosmetically, there's small scuff of on the passenger side rear bumper and other minor scratches, so you might want to factor in the cost of getting these sorted if you're negotiating on price. The Monoblock alloys fitted to Brabus models are prone to buckle and the lacquer was poor so you'll want to check all four carefully. These wheels were refurbished in December 2014 with new tyres so they should be good for a few more years yet. This Roadster also has an upgraded stainless steel exhaust and had a new clutch at 55,000 miles. It has the feeling of a car that's been cared for by an enthusiastic owner. Other plus points? It has a retractable fabric hood rather than the creaky and cumbersome 'targa' roof plus there's a fresh MoT and a full specialist service history. According to the seller, there's also £10k worth of receipts from its lifetime. The big problem with Smart Roadsters and Roadster Coupes is leaks. Big leaks. We're not talking from the roof here but the actual body. This means that water can get into the electrics and ECU. And it's expensive to fix. My personal car suffered this and spent four weeks at a Smart dealership having a new wiring loom and all the panels resealed at a cost of £3000. Smart and Mercedes-Benz denied it was a recall but I still only had to pay £100 and was given a courtesy car while mine was off the road. That's why the advert refers to this car as 'completely dry' and you'll want to thoroughly check. If you're thinking of buying one you'll need to keep it garaged and avoid driving it in heavy rain if possible. It's not ideal but then the Smart Roadster is not a car for practicality. It's a fun yet affordable two-seater that's destined to be a future classic.